If there’s one thing a great event planner needs it’s creativity.Add to that diversity, flexibility and insight and you’ve got Katia Kokaliari who took her extensive experience in strategic marketing, corporate communication and event planning for the advertising, automotive, telecoms, media & entertainment industries and created Bond Events, organizing the finest events in Greece and abroad for an impressive roster of clients. Katia believes in the ‘people factor’, she’s handpicked her team of the market’s very best professionals to join her in creatively transforming your idea into that unforgettable event that leaves a lasting impression. 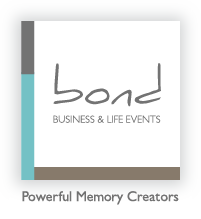 The people at Bond are a forward-thinking group of seasoned professionals from the fields of event planning, luxury hospitality, individual and corporate travel. A shared vision and passion set their work apart. Inspiration is key to event planning that will touch a chord and leave a mark. Greece, its isles and mainland villages, pristine beaches and tiny coves, mountains and valleys, and its delectable edibles and excellent wines, is the ideal destination. It’s no wonder Greece’s Nobel Prize-winning poet Odysseas Elytis described the country as ‘This small, this Great World’. Simply put: Greece is the place dreams are made of… and Bond’s team knows how to make it happen. At Bond Events, we believe it’s all about getting the right results. And to do that we listen. We pay attention to detail. We think creatively. We know the right people in the right places. We work together to guarantee that your event – whether it’s a wedding, a product launch, a conference, a party, a special happening or your myth in Greece – is exactly what you have in mind and much more. Why? Because we love what we do. For its exclusive event planning services, Bond has won several distinctions including the Gold Award in the Greek Tourism Awards in 2016 and 2017. Katia was born and raised in Athens, Greece. Katia is a talented communication and marketing professional, with the quality to bring value and innovation to every project she is involved in. As a strategic and conceptual thinker, she has a strong ability to effectively manage creative resources with a success-oriented attitude. She has worked for Forthnet S.A. where she developed the Strategic Marketing and Communication functions for their telecom services and pay TV operations. Prior to that, she worked for the Fiat Group Automobiles Hellas managing their Marketing Communication & Media requirements for over a decade. She was also Account Director for major multinational advertising agencies and also managed the Corporate Communication division for the leading Greek daily «Kathimerini». Katia’s experience is diverse, she has a strong understanding of cross cultural communication and her ‘out of the box’ thinking is what gave her the competitive edge in her communication and marketing career. She is an avid communicator, with expert knowledge of traditional and digital media environments. During her career she has cultivated trusting and long-standing relationships with journalists both in Greece and abroad. Katia is an organized, proactive, flexible and efficient team player, bringing wit and devotion to the projects she takes on. She speaks fluent English and Italian, and good French. Her interests are as diverse as her background and they include tennis, open-sea sailing, decoration and cinema. Katia studied Marketing and Public Relations both in Greece and abroad and she holds a Master of Business Administration (MBA) from University of Sunderland in the UK.